We have 35 new polls today, with updates to the map in 16 states. Wisconsin is the only state that has switched sides as a result of a new Strategic Vision (R) poll showing Bush ahead there 46% to 49%, although this is within the margin of error. Also, Minnesota is now tied according to a new Rasmussen 7-day tracking poll. The changes in the other states do not cause any electoral votes to change. Survey USA has conducted a poll in 30 states and reported that men are from Bushland and women are from Kerryland. Interestingly enough the state with the biggest gender gap is Georgia, where it is 28%. Those southern belles don't actually like Kerry (they support Bush by 6%), but the Georgia men prefer Bush by a huge 34%. The gender gap is also very high in Rhode Island, Oregon, Nevada, and Florida. Only in two states, Kansas and North Carolina, does Bush do better among women than among men. Kerry's advantage with women averages 11%. With the upcoming get-out-the-vote efforts, it won't be surprising to see the Republicans focusing on men and the Democrats focusing on women. It is surprising that Bush and Kerry don't like each other very much. After all they are family: ninth cousins twice removed to be exact. Thanks to politicalwire.com for pointing this out. Although I have explained this before, it seems to be confusing some people, so I will try again. The poll that is used is the one that was conducted most recently. It is the middle date of the POLLING PERIOD that matters. The RELEASE DATE does not matter at all. For example, yesterday I announced a new Zogby poll in Florida taken Oct. 13-17. But there was already a Survey USA poll taken Oct. 15-17 in Florida. The Zogby poll has a middle date of Oct. 15. The Survey USA poll has a middle date of Oct. 16. 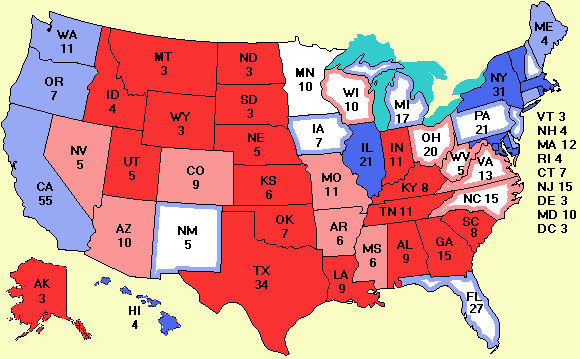 Thus the Zogby poll did NOT replace the Survey USA poll on the map because it was older. Some pollsters get their results out the door a bit faster than others. What matters is the middle date of the polling period. And if there are ties, such as Oct. 13-17 vs. Oct. 14-16, the shorter one wins because it is a better snapshot. If multiple polls with the same polling period are tied for most recent, they are averaged. All the data is in the Polling data to the right of the map. If you don't understand why a poll was or was not used, look there. The first column is the middle date, counting forward from Sept. 1, so Oct. 1 is 31.0, Oct. 12 is 42.0, etc. For each state, all polls are sorted in descending order, most recent on top. This file can be read by Excel. Tuesday I cited Richard L. Hasen on five ways this election could end up in the Supreme Court. Let me now add a sixth way. Today salon.com reported massive snafus with getting absentee ballots to the estimated 4 million American voters overseas. The office in charge of helping overseas Americans to vote is totally ineffective. In 2000 it was excoriated by the GAO for losing thousands of overseas votes. It now appears to be doing its best to make sure the 10% of overseas Americans who are in the military (and largely Republican) can vote while ignoring the 90% who are civilians and who hear about America's loss of respect in the world daily and are much more likely to want to replace George Bush. The office is dawdling about putting the emergency write-in ballot on its website, so Americans overseas who need one should get it from their consulate or embassy. The case which may well hit the Supreme Court will revolve about a simple question: Can a county send a voter his absentee ballot by snail mail to a far-away country a couple of days before the election and then refuse to count it because it came back after the deadline? As some people pointed out, there were a couple of minor glitches in the new software at first. I fully realize that software should be thoroughly tested before being deployed, but there is no time. The new predicted map had wacky 2000 scores because the program that made the spreadsheet with the new data didn't print a header line as the other spreadsheets have. But the map-making software skips line 1 as a presumed header and assumes line 2 is Alabama, line 3 is Alaska, etc. So in the map, every state had the 2000 results of a different state. Both programs were actually correct, but the output produced by program 1 didn't match the input expected by program 2. There was also an ambiguity about what Nader is assumed to have. Originally it was 2%, but after all the Zogby polls came in showing him at 0.5%, I changed the parameter to 1% and forgot to change the text. Haste makes waste. And working on the site 10, 12 hours a day (including reading the mail) doesn't help, either. I am really determined to defeat the hackers, so I just added a sixth server. It is www.electoral-vote6.com. Again, use the main site under normal conditions, but if that doesn't work, try www.electoral-vote2.com, www.electoral-vote3.com, etc., currently up to 6.